LeTip International’s structure sets the standard in the word-of-mouth referral industry. Members are known for their professionalism, dedication, and loyalty to one another and to the LeTip Program. 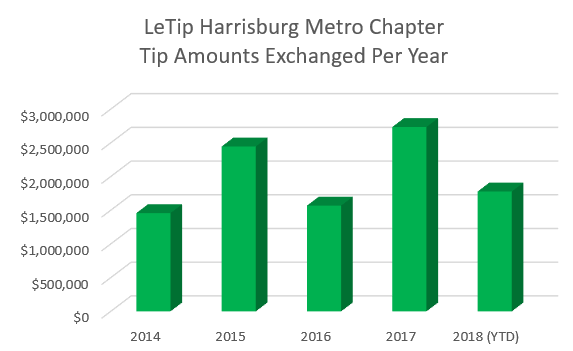 Our LeTip Harrisburg Metro chapter meets weekly to exchange qualified leads, build solid business relationships, develop strong presentation skills, and become proficient networkers. Only one representative of any given profession is accepted into a chapter, and members are chosen for their occupational expertise. Dream big! There is no box! A Member of Harrisburg Metro Letip. Our chapter meets every Thursday from 11:31 a.m. – 1:01 p.m. at the Perkins Restaurant, just north of the intersection of Rt. 81 and Rt. 39. You are welcome to attend to see how being a member of LeTip can help you grow your business. This funny video, “The Tale of Two Tippers”, was created by LeTip International to help a prospective member understand how LeTip can help generate more business. 1. LeTip membership puts “Dollars in your pocket”. 2. LeTip members learn to be better public speakers. 3. LeTip is a family, and members are loyal to one another. 4. LeTip members have a reliable source of business professionals to recommend to clients, family and friends. 5. LeTip stimulates the “Feel Good Factor” – that great feeling you get in your heart when you help another towards success. “I have been in LeTip for 3 1/2 years. I am the Dry Cleaner of our chapter. The relationships I’ve built with the members in my chapter are priceless. There are many members I do business with. I needed a house so I used our realtor, mortgage lender, insurance person, plumber, electrician, and now general contractor for an addition. My car breaks down or needs maintenance – I know a reputable mechanic; he’s in the chapter. Our group’s credit card processor has saved me a thousand dollars a year on fees. The group’s accountant straightened out my books and payroll that was totally obliterated by my previous accountant. When I get overly stressed, my massage therapist, who is in the group, relaxes me. Our group’s Chiropractor keeps me from getting leg cramps. I found a hair stylist that cuts my hair properly every time. Guess where I found him…LeTip. Financial guy – did you know you can save $5 a week and open up a 401K? How about a Lawyer that gives you information just to protect you. We have an outstanding person. Always thinking ahead, I’ve planned for my final resting place with our chapter’s funeral director. You may think it’s creepy, but our director took the creepiness out of it. Now my family doesn’t have to deal with it. There are many more people in the group that I’ve used, but haven’t mentioned. There are some I have never used, because I haven’t needed their services, but I would and do refer them because I hear about their reputation from other members who have. My business has grown from this chapter’s members’ contributions. My profits far outweigh the cost of belonging. Not only have I forged business relationships with these people, but a few of them have became very close, dear friends that I would do anything for. If you seriously want to grow your business and wouldn’t mind forging new relationships, contact LeTip. The organization has chapters throughout the world.